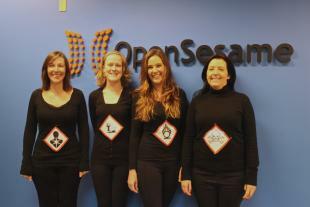 Happy Halloween OpenSesame followers! As you prepare for the parade of adorable, and occasionally spooky, trick-or-treaters this evening, we here at OpenSesame have a treat to offer of our own. More deals! Email subscribers will continue to receive a weekly email, now with multiple offers in a digest format. Our weekly Course of the Week blog posts will also include information for all four course deals. What if I want deals for just one category? Looking for only business skills or compliance course deals? Update your email preferences at any time to limit your Course of the Week email to a single category. Additionally, you can sign-up for our monthly e-newsletter which includes information about new sellers and general updates from OpenSesame. You’re not getting the Course of the Week deals you say? Alright, so maybe we have one little trick. It is Halloween after all! Can you guess what our group costume is? First commenter to successfully name the program, as well as the labels we represent, wins a $10 Starbucks giftcard. We’ll even give you a hint to get you started. Enjoy Halloween night and be on the lookout for our new Course of the Week format, starting next Wednesday!